It’s International Coffee Day today! 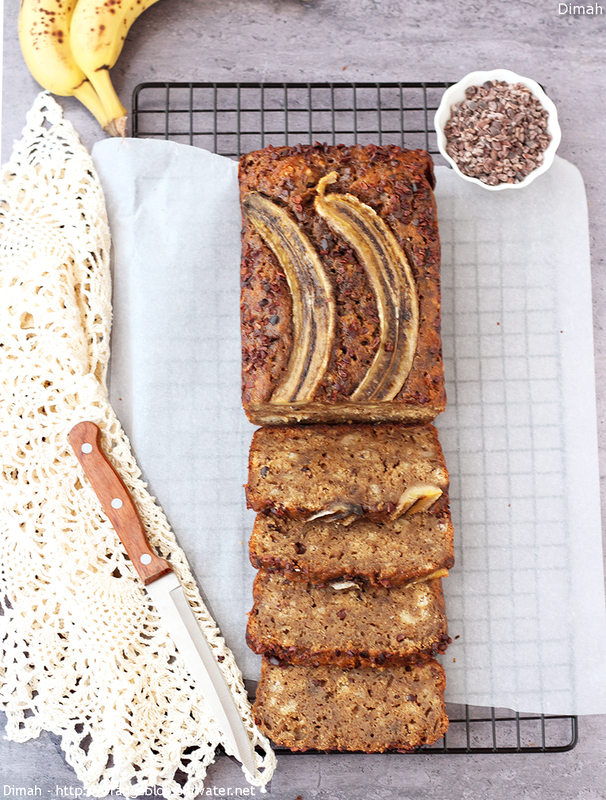 If you love banana bread and coffee as much as I do, you will love Edd Kimber’s Espresso and cocoa nib banana bread. 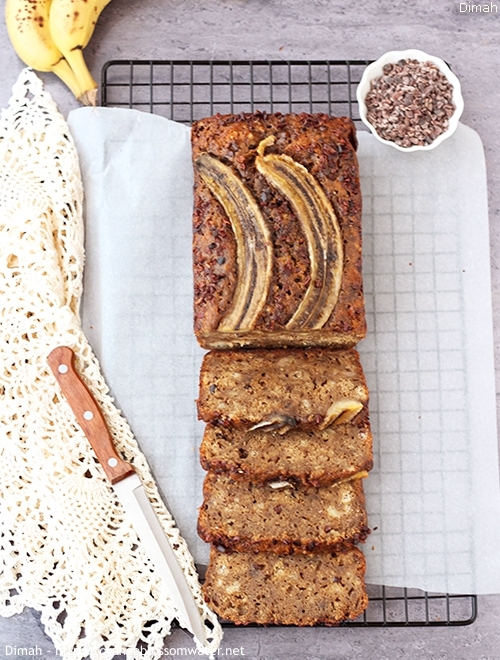 It infuses the banana bread with a lovely coffee flavor. It’s present without being overpowering or too intense. 1. 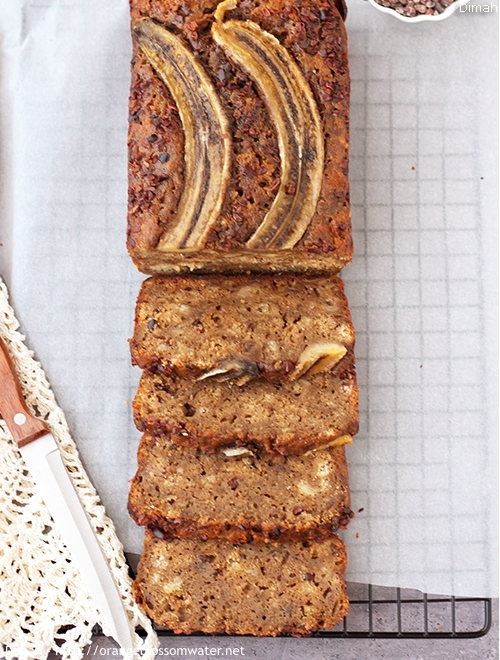 To make the banana bread, grease 2 lb loaf tin with a little butter and line with a strip of parchment paper, so that the ends hang over the long sides of the pan (this makes removal of the cake a lot easier) and preheat the oven to 350 °F (180 °C (160 °C fan). 2, 3, 4. 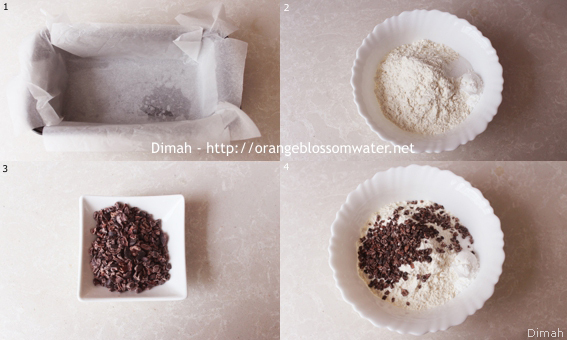 Place the flour, baking powder, salt, and about 2/3 of the cocoa nibs into a bowl and whisk together to combine. 5, 6. 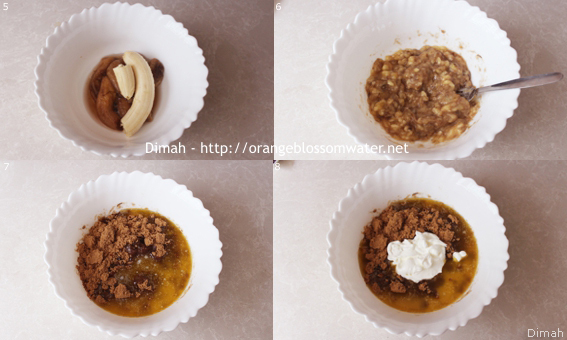 Place the banana into a large bowl and use a fork to mash, until just a few small lumps remain. 7, 8. Add sugar, melted butter and sour cream. 9, 10. Dissolve three tablespoons of coffee in two tablespoons of hot water, then add to the banana mixture. 11, 12. 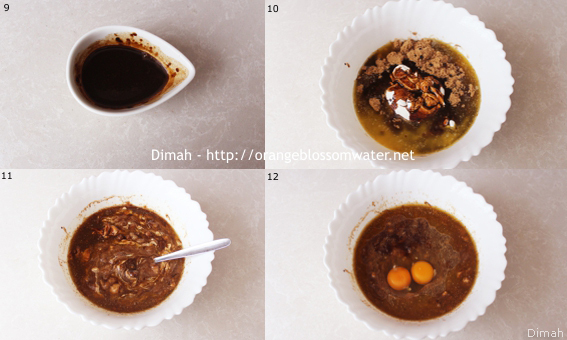 Add eggs and vanilla extract and mix together until smooth and uniformly combined. 13, 14, 15, 16. Pour the flour mixture over the banana mixture and gently fold together, mixing until the flour is just combined, but being very careful not to over mix, as this will make the bread chewy and tough. 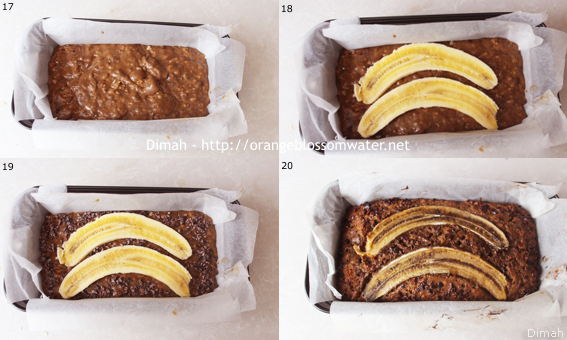 17, 18, 19, 20.Scrape the batter into the prepared pan and top with the remaining banana, simply sliced through the middle and placed on top, cut side showing. Sprinkle the remaining cocoa nibs on top of the cake, avoiding the banana. 21. Bake in the preheated oven for about 50 – 55 minutes or until a skewer inserted into the middle of the cake comes out just about clean. Allow the cake to cool in the pan for 15 minutes before carefully inverting onto a wire rack to cool completely. 21. Kept wrapped in clingfilm in a sealed container this cake will keep for up to three days but can also be frozen for up to a month. 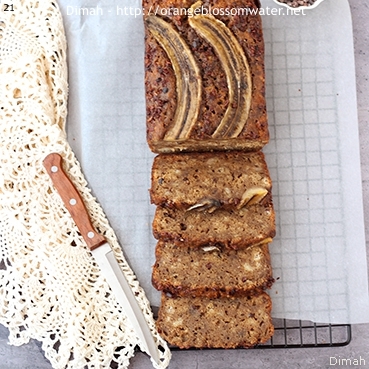 To make the banana bread, grease 2 lb loaf tin with a little butter and line with a strip of parchment paper, so that the ends hang over the long sides of the pan (this makes removal of the cake a lot easier) and preheat the oven to 350 °F (180 °C (160 °C fan). 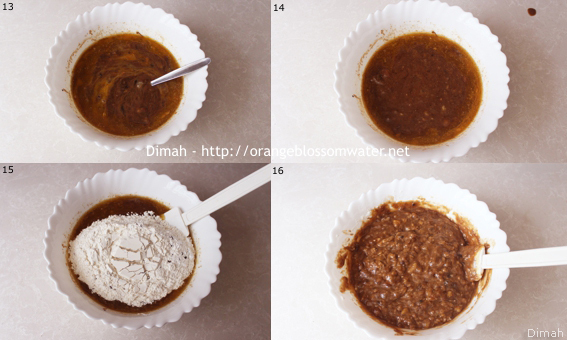 Place the flour, baking powder, salt, and about 2/3 of the cocoa nibs into a bowl and whisk together to combine. Place the banana into a large bowl and use a fork to mash, until just a few small lumps remain. Add sugar, melted butter and sour cream. Dissolve three tablespoons of coffee in two tablespoons of hot water, then add to the banana mixture. Add eggs and vanilla extract and mix together until smooth and uniformly combined. Pour the flour mixture over the banana mixture and gently fold together, mixing until the flour is just combined, but being very careful not to over mix, as this will make the bread chewy and tough. Scrape the batter into the prepared pan and top with the remaining banana, simply sliced through the middle and placed on top, cut side showing. Sprinkle the remaining cocoa nibs on top of the cake, avoiding the banana. Bake in the preheated oven for about 50 – 55 minutes or until a skewer inserted into the middle of the cake comes out just about clean. Allow the cake to cool in the pan for 15 minutes before carefully inverting onto a wire rack to cool completely. Kept wrapped in clingfilm in a sealed container this cake will keep for up to three days but can also be frozen for up to a month. You can add the ground coffee at the beginning to the dry ingredients without dissolving it in hot water, but If you want the coffee flavor to be strong then I would suggest adding two tablespoons of hot water to the coffee and stirring together before adding to the wet ingredients, this way the flavor will soak into the bread a lot more. The type of coffee I used is Nescafe Gold. This entry was posted on Monday, October 1st, 2018 at 8:37 PM	and is filed under Baking and Desserts. You can follow any responses to this entry through the RSS 2.0 feed. You can skip to the end and leave a response. Pinging is currently not allowed.